Above: Navajo Lake Trail, July 31, 2015 and July 16, 2018. Left: El Diente Trail, July 31, 2008 and East Fork Trail, September 7, 2011. 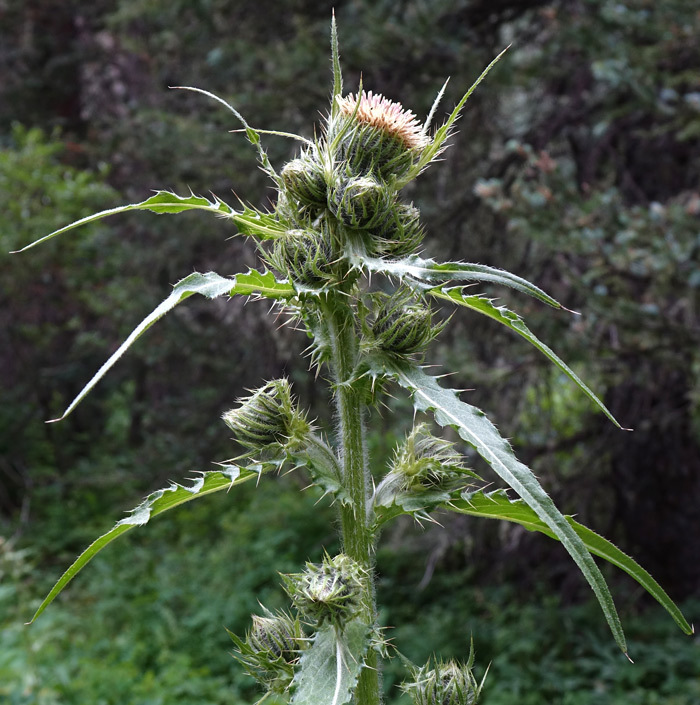 Cirsium parryi is common in moist mountain meadows of Arizona, New Mexico, and Colorado. 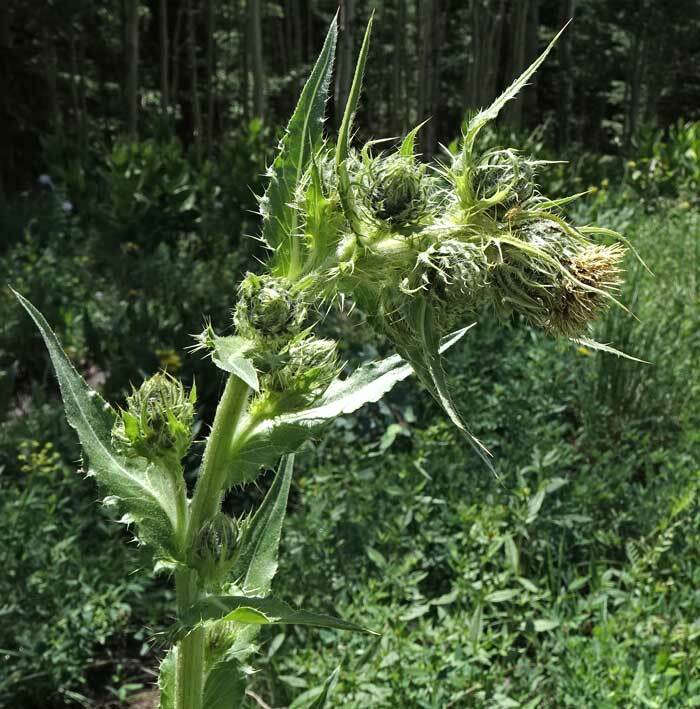 It occurs singly or in scattered patches, grows to a very eye-catching three to six feet tall and is cobwebby hairy around the mature flower head. 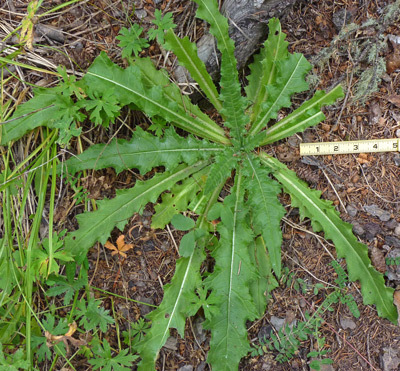 Leaves may be deeply or shallowly cut or may have wavy margins. Horse Creek Trail, August 11, 2009. East Fork Trail, September 7, 2011 and El Diente Trail, July 31, 2008. 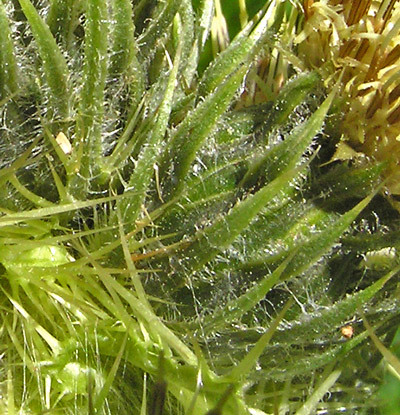 Involucres (the mass of green phyllaries below the actual flower head) are cobwebby hairy. In the top photograph at left, the glistening hairs are beginning to lengthen in the uppermost very fresh flower. 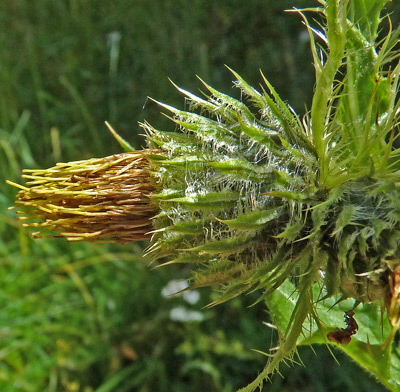 Four flower buds surround the one open flower and they are still completely enclosed by the phyllaries. 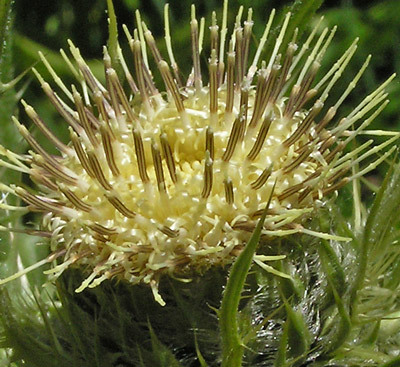 In the second and third photographs at left, you can see the straight, pointed tips of the phyllaries and the numerous, often cob-webby, white hairs. Under magnification, the straight hairs are seen to be made up of a number of cells with cell walls clearly visible. 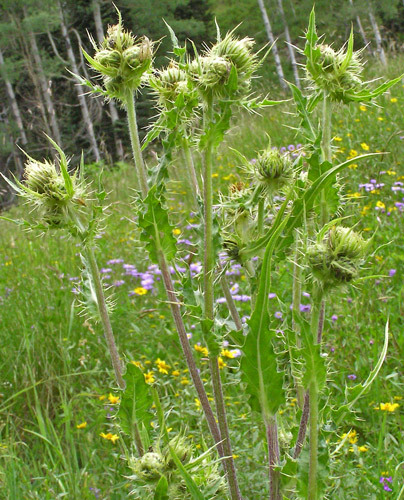 The second photograph shows the flower head late in the season after flowers have been pollinated and the seeds have matured. El Diente Trail, July 31, 2008. Flowers are most often a yellow/white. 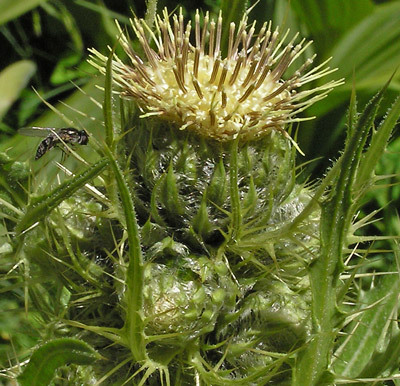 As is true for all Thistles, the flower is composed of a mass of disk flowers; there are no ray flowers surrounding the disk. East Fork Trail, September 7, 2011. Basal leaves in shady Spruce forests are quite large, commonly growing to twelve inches long. 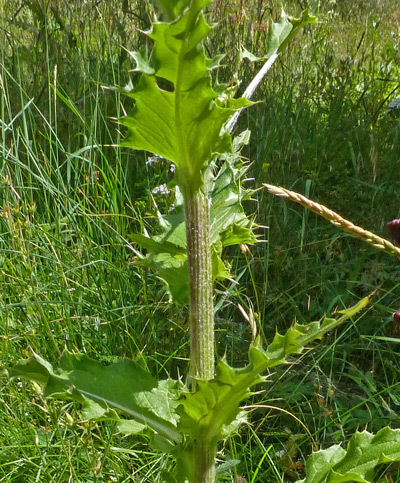 The basal leaves are evident months before the plants flower. Roaring Fork Road, July 28, 2015. Leaves vary widely in shape; they can be deeply lobed, moderately lobed or wavy-edged. Spines can be minute or a centimeter long but they are always sharp. 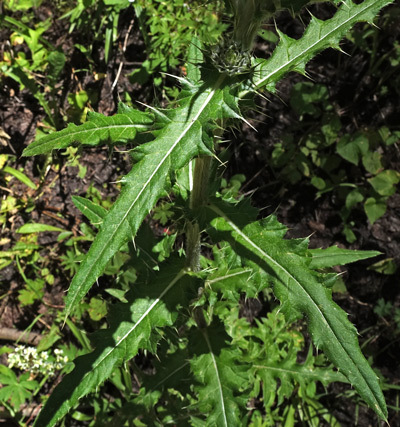 Leaves can have a slight winged petiole, but more often are sessile. They also can be clasping or decurrent i.e., continuing down the stem and blending into the stem.